Taking care of your skin is very important. Cleaning your face should be a daily routine for a healthy and good looking skin. The Clarisonic cleans your skin very well. I've used my Clarisonic Mia 2 device for almost two weeks daily now and I would love to tell you more about it. The Clarisonic is 149 en includes a the Clarisonic device with a brush, a travel case and a charger. Extra brushes are also available for 25 each and need to be renewed every three months. It al started in 2001 when Dr. Robb Akridge, David Giuliani and Ken Pilcer from Seattle came with the idea of creating sonic device. They launched the Clarisonic without any marketing plan and it became a huge succes because many dermatologists wanted to use the devices in their clinics. Now many years later the Clarisonic is used by over four thousand dermatologists and has won many prizes. Today it has sold over 15 million of it's much loved devices and is availeble in over 50 countries around the world. Studies have shown that the Clarisonic brush cleanses your face 6 times better than with your hands. The device also makes your pores less and ingeredients from skincare products are better absorbed in your skin. The Clarisonic is suitable for every skintype, even for the sensible skin. What I really love about the Clarisonic is that the device is waterproof. It's very easy to use it under the shower or in your bath. You can charge your device with the charged that got delivered with the Clarisonic. Charging takes about 17/18 hours and than you can use it for 24 minutes. It's recommended that you clean your brush once a week with water and soap. Clarisonic brushes are made from non-porous soft elastomeric material and resistant to bacterial attachment. All brush heads are designed to oscillate bi-directionally at a sonic frequency and are perfect to use twice a day. The brush removes your makeup and cleanses really well. With the button above the on button you can let the brush go faster or slower. 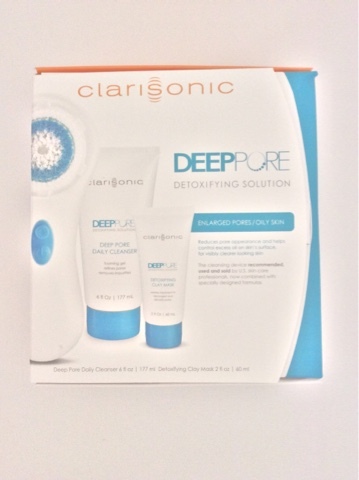 In my package I also received a Clarisonic Deep Pore Daily Cleanser and a detoxifying clay mask. The cleanser is basically a foaming gel and refines pores and removes impurities. I'm really in love with this product because afterwards my skin felt really clean and soft which I didn't expect after one time. In just 60 seconds you have a smoother and cleaner skin. When I started using it again and again the result was the same, a very healthy skin and the pores were a little bit less. Once a week I used the detoxifying clay mask and again I was very surprised. I had never used any sort of clay mas before and after using it the second timely skin did really feel better and it felt really clean. I think the combination of the Clarisonic device and the skincare products are a great skincare routine. Are you still there!? I know it's long but I'm just so excited that I want to tell everything! For years I've known Clarisonic but I never bought one myself. I thought it was expensive and didn't know if it would benefit my daily skincare routine. 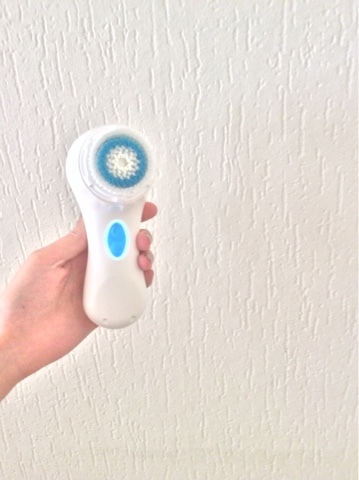 But after receiving my Clarisonic I was immediately in love with it! The device is very easy to use. I always start with my cheeks, after 20 seconds there is a buzz and I go to my right cheek, than to my forehead and chin and so on. You feel the device buzzing really gently and you have to make small circles with the brush too. After a few days my skin started to improve and I had less brake outs than before. I even got a compliment from a friend who said my skin looked so soft! Now I understand why many people are using the Clarisonic. In comparison to cleaning your face with your hands, this device really cleans your face more intense and way better and is very gentle on your skin. As winter is coming and Christmas as well the Clarisonic is a great gift for you bff, for the holidays or for birthdays as well! I hope you enjoyed my reading my post! Get 15% off now of your device when you enter the code HERCAMPUS and is valid through October 31. Have you ever tried the Clarisonic? I love my Clarisonic Mia and use it 2-3 times a week when I'm not using an exfoliating scrub. Nice info and beautifully explained. I've seen this product so many times and never thought to buy it. Now after this I think I just might! Thanks for this post!